Laos Sky imaged by Peter Wise ©Peter Wise. The smooth rounded clouds immediately above the anvil shaped thunder head are 'pileus' or cap clouds formed when a layer of moist air is cooled as it is pushed upward by the boiling cumulus beneath. 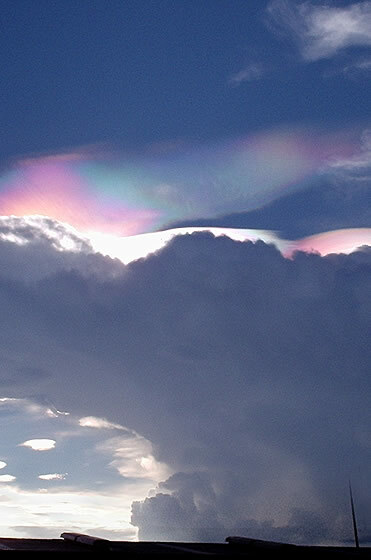 Cloud so freshly formed has uniform sized droplets or ice crystals and shows bright iridescence. 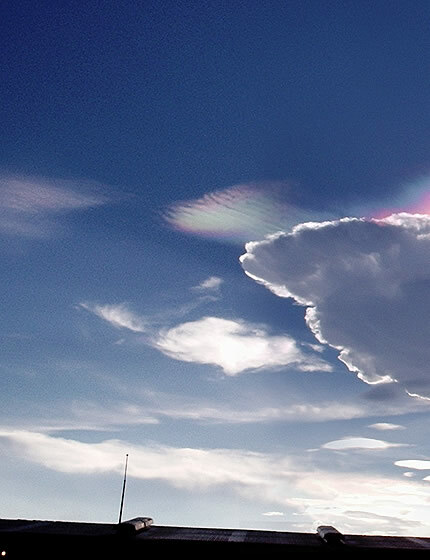 The ribbed iridescence is possibly in higher cirrocumulus stratiformis, 'herringbone' clouds. In the distance are a variety of lenticular cloud, also famous for iridescence.